Tofu, also known as bean curd, is a food made by coagulating soy milk and then pressing the resulting curds into soft white blocks. It is a component in East Asian and Southeast Asian cuisines. Tofu can be soft, firm, or extra firm. Tofu has a subtle flavor and can be used in savory and sweet dishes. It is often seasoned or marinated to suit the dish. Tofu-making is first recorded during the Chinese Han dynasty some 2,000 years ago. Chinese legend ascribes its invention to prince Liu An (179–122 BC). Tofu and its production technique were introduced into Korea and then Japan during the Nara period (710–794). Some scholars believe tofu arrived in Vietnam during the 10th and 11th century. It spread into other parts of Southeast Asia as well. This spread probably coincided with the spread of Buddhism because it is an important source of protein in the vegetarian diet of East Asian Buddhism. Li Shizhen in the Ming Dynasty described a method of making tofu in the Compendium of Materia Medica. Tofu has a low calorie count and relatively large amounts of protein. It is high in iron, and depending on the coagulants used in manufacturing (e.g. calcium chloride, calcium sulfate, magnesium sulfate), it can have a high calcium or magnesium content. The term tofu is used by extension for similarly textured curdled dishes that do not use soy products, such as "almond tofu" (almond jelly), tamago-dōfu (egg), goma-dōfu (sesame), or peanut tofu (Chinese 落花生豆腐 luòhuāshēng dòufu and Okinawan jīmāmi-dōfu). The English term comes from Japanese tōfu (豆腐), borrowed from the original Chinese equivalent (豆腐 or 荳腐) transcribed tou4-fu3 (Wade-Giles) or dòufu (pinyin), literally "bean" (豆) + "curdled" or "fermented" (腐). A reference to the word "towfu" exists in a letter dated 1770 from the English merchant James Flint to United States statesman and scientist Benjamin Franklin. This is believed to be the first documented usage of the word in English. The term "bean curd(s)" for tofu has been used in the United States since at least 1840. It is not frequently used, however, in the United Kingdom, Australia or New Zealand. Tofu is made by coagulating soy milk and pressing the resulting curds. Although pre-made soy milk may be used, some tofu producers make their own soy milk by soaking, grinding, boiling and straining dried (or, less commonly, fresh) soybeans. Coagulation of the protein and oil (emulsion) suspended in the boiled soy milk is the most important step in the production of tofu. This process is accomplished with the aid of coagulants. Two types of coagulants (salts and acids) are used commercially. Calcium sulfate (gypsum): The traditional and most widely used coagulant to produce Chinese-style tofu, it produces a tofu that is tender but slightly brittle in texture. The coagulant itself has no perceivable taste. Use of this coagulant also makes a tofu that is rich in calcium. As such, many tofu manufacturers choose to use this coagulant to be able to market their tofu as a good source of dietary calcium. Chloride-type Nigari salts or Lushui ( Traditional: 鹵水, 滷水; Simplified: 卤水, lǔshuǐ) - Magnesium chloride and calcium chloride: Both of these salts are highly soluble in water and affect soy protein in the same way, whereas gypsum is only very slightly soluble in water and acts differently in soy protein precipitation, the basis of tofu formation. These are the coagulants used to make tofu with a smooth and tender texture. In Japan, a white powder called nigari, which consists primarily of magnesium chloride, is produced from seawater after the sodium chloride is removed and the water evaporated. Depending on its production method, nigari/Lushui may also contain small quantities of magnesium sulfate (Epsom salt), potassium chloride, calcium chloride, and trace amounts of other naturally occurring salts. Although the term nigari is derived from nigai, the Japanese word for "bitter," neither nigari nor pure magnesium chloride imparts a perceivable taste to the finished tofu. Calcium chloride is a common coagulant for tofu in North America. Fresh clean seawater itself can also be used as a coagulant. Glucono delta-lactone (GDL): A naturally occurring organic acid also used in cheese making, this coagulant produces a very fine textured tofu that is almost jelly-like. It is used especially for "silken" and softer tofus, and confers an almost imperceptible sour taste to the finished product. It is commonly used together with calcium sulfate to give soft tofu a smooth tender texture. Other edible acids: Though they can affect the taste of the tofu more, and vary in density and texture, acids such as acetic acid (vinegar) and citric acid (such as lemon juice), can also be used to coagulate soy milk and produce tofu. Among enzymes that have been shown to produce tofu are papain, and alkaline and neutral proteases from microorganisms. In the case of papain, the enzyme-to-substrate ratio, by weight, was held constant at 1:400. An aliquot of 1% crude papain was added to "uncooked" soy milk at room temperature and heated to 90–100 °C (194–212 °F). Papain, moreover, has been studied as a gelling agent to produce "instant tofu" from soy protein isolate and soy glycinin (11S) protein. 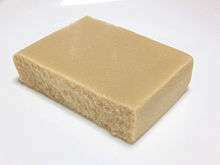 Contemporary tofu manufacturers may choose to use one or more of these coagulants, since each plays a role in producing a desired texture in the finished tofu. Different textures result from different pore sizes and other microscopic features in tofu produced using each coagulant. The coagulant mixture is dissolved into water, and the solution is then stirred into boiled soy milk until the mixture curdles into a soft gel. The curds are processed differently depending on the form of tofu that is being manufactured. For soft silken tofu (嫩豆腐; nèn dòufu) or tofu flower (豆花, dòuhuā) the soy milk is curdled directly in the tofu's selling package. For standard firm Asian tofu, the soy curd is cut and strained of excess liquid using cheese cloth or muslin and then lightly pressed to produce a soft cake. Firmer tofus, such as Asian dry tofu (豆干) or Western types of tofu, are further pressed to remove even more liquid. In Vietnam, the curd is strained and molded in a square mold, and the end product is called đậu khuôn (molded bean) or đậu phụ (one of the Vietnamese ways to pronounce the Chinese dòufu). The tofu curds are allowed to cool and become firm. The finished tofu can then be cut into pieces, flavored or further processed. Although tartness is sometimes desired in dessert tofu, the acid used in flavoring is usually not the primary coagulant, since concentration sufficiently high to induce coagulation negatively affects the flavor or texture of the resulting tofu. A sour taste in tofu and a slight cloudiness in its storing liquid is also usually an indication of bacterial growth and, hence, spoilage. A wide variety of tofu is available in both Western and Eastern markets. Despite the range of options, tofu products can be split into two main categories: 'fresh tofu', which is produced directly from soy milk, and 'processed tofu', which is produced from fresh tofu. Tofu production also creates important by-products that are used in various cuisines. Depending on the amount of water that is extracted from the tofu curds, fresh tofu can be divided into three main varieties: soft (or silken), firm, and extra firm. Fresh tofu is usually sold completely immersed in water to maintain its moisture content. Soft/silken tofu (嫩豆腐 or 滑豆腐, nèn dòufu or huá dòufu, in Chinese, lit. "soft tofu" or "smooth tofu"; 絹漉し豆腐, kinugoshi tōfu in Japanese, lit. "silk-filtered tofu"; 순두부, 純豆腐, sundubu in Korean, lit. "pure tofu") is undrained, unpressed tofu that contains the highest moisture content of all fresh tofus. Silken tofu is produced by coagulating soy milk without curdling it. Silken tofu is available in several consistencies, including "soft" and "firm", but all silken tofu is more delicate than regular firm tofu (pressed tofu) and it has different culinary uses. In Japan and Korea, traditional soft tofu is made with seawater. Silken tofu is a versatile, reliable substitute for dairy products and eggs, especially for smoothies and baked desserts. Douhua (豆花, dòuhuā or 豆腐花, dòufuhuā in Chinese), or tofu brain (豆腐腦 or 豆腐脑, dòufunaǒ in Chinese) is often eaten as a dessert, but sometimes salty pickles or hot sauce are added instead. This is a type of soft tofu with an even higher moisture content. Because it is very difficult to pick up with chopsticks, it is generally eaten with a spoon. With the addition of flavorings such as finely chopped spring onions, dried shrimp, soy sauce, or chilli sauce, douhua is a popular breakfast dish across China. In Malaysia, douhua is usually served warm with white or dark (palm) sugar syrup, or served cold with longans. Some variation exists among soft tofus. Black douhua (黑豆花, hēidòuhuā) is a type of silken tofu made from black soybeans, which is usually made into dòuhuā (豆花) rather than firm or dry tofu. The texture of black bean tofu is slightly more gelatinous than regular douhua and the color is greyish in tone. This type of tofu is eaten for its earthy "black bean taste." Edamame tofu is a Japanese variety of kinugoshi tōfu made from edamame (fresh green soybeans); it is pale green in color and often studded with whole edamame. 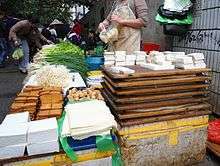 Various tofu products in a market in Haikou City, Hainan Province, China – Left side: Brown rectangles of soy-sauce stewed dougan tofu, puffed, deep-fried tofu, tofu skin, and large blocks of plain tofu. Right side: Standard pieces sitting atop wooden boards, which press water from the tofu in between. Firm tofu (called 老豆腐 lǎo dòufu in Chinese; 木綿豆腐, momen-dōfu in Japanese, lit. "cotton tofu"; 단단한두부, dandanhan dubu in Korean): Although drained and pressed, this form of fresh tofu still contains a great amount of moisture. It has the firmness of raw meat and bounces back readily when pressed. 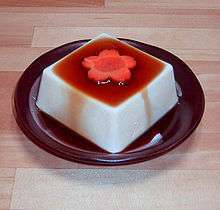 The texture of the inside of the tofu is similar to that of a firm custard. The skin of this form of tofu has the pattern of the muslin used to drain it and the outside is slightly more resistant to damage than the inside. It can be picked up easily with chopsticks. In some places in Japan, a very firm type of momen-dōfu is eaten, called ishi-dōfu (石豆腐; literally stone tofu) in parts of Ishikawa, or iwa-dōfu (岩豆腐; literally rock tofu) in Gokayama in the Toyama prefecture and in Iya in the prefecture of Tokushima. Due to their firmness, some of these types of tofu can be tied by rope and carried. These types of firm tofu are produced with seawater instead of nigari (magnesium chloride), or using concentrated soy milk. Some of them are squeezed to eliminate excess moisture by using heavy weights. These products are produced in areas where travelling is inconvenient, such as remote islands, mountain villages, and heavy snowfall areas. Dòu gān (豆干, literally "dry tofu" in Chinese) is an extra firm variety of tofu where a large amount of liquid has been pressed out. Dòu gān contains the least amount of moisture of all fresh tofu and has the firmness of fully cooked meat and a somewhat rubbery feel similar to that of paneer. When sliced thinly, this tofu can be crumbled easily. The skin of this form of tofu has the pattern of the muslin used to drain and press it. Western firm tofu is milled and reformed after pressing and sometimes lacks the skin with its cloth patterning. 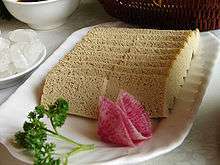 One variety of dried tofu is pressed especially flat and sliced into long strings with a cross section smaller than 2 mm × 2 mm. Shredded dried tofu (豆干絲, dòugānsī in Chinese, or simply 干絲, gānsī), which looks like loose cooked noodles, can be served cold, stir-fried, or similar in style to Japanese aburaage. Many forms of processed tofu exist, due to the varied ways in which fresh tofu can be used. Some of these techniques probably originate from the need to preserve tofu before the days of refrigeration, or to increase its shelf life and longevity. Other production techniques are employed to create tofus with unique textures and flavors. Pickled tofu (豆腐乳 in Chinese, pinyin: dòufurǔ, or 腐乳 fŭrŭ; chao in Vietnamese): Also called "preserved tofu" or "fermented tofu," consists of cubes of dried tofu that have been allowed to fully air-dry under hay and slowly ferment with the help of aerial bacteria. 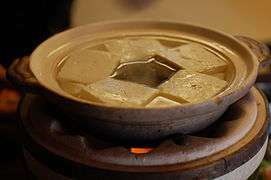 The dry fermented tofu is then soaked in salt water, Chinese wine, vinegar, and minced chiles, or in a unique mixture of whole rice, bean paste, and soybeans. In the case of red pickled tofu (紅豆腐乳 in Chinese, Pinyin: hóng dòufurǔ), red yeast rice (cultivated with Monascus purpureus) is added for color. In Japan, pickled tofu with miso paste is called "tofu no misodzuke," which is a traditional preserved food in Kumamoto. In Okinawa, pickled and fermented tofu is called "tofuyo"(豆腐餻). It is made from "Shima-doufu" (an Okinawan variety of large and firm tofu). It is fermented and matured with koji mold, red koji mold, and awamori. Stinky tofu (臭豆腐 in Chinese, Pinyin: chòudòufu): A soft tofu that has been fermented in a unique vegetable and fish brine. The blocks of tofu smell strongly of certain pungent cheeses, or even rotten food. Despite its strong odor, the flavor and texture of stinky tofu is appreciated by afficionados, who describe it as delightful. The texture of this tofu is similar to the soft Asian tofu from which it is made. The rind that stinky tofu develops from frying is said to be especially crisp, and is usually served with soy sauce, sweet sauce, or hot sauce. Two kinds of dried tofu are produced in Japan. They are usually rehydrated by being soaked in water prior to consumption. In their dehydrated state they do not require refrigeration. Koya tofu (also known as shimidofu) is made using nigari. Kori tofu (literally "frozen tofu") is freeze-dried. Tofus such as firm Asian and dòu gān (Chinese dry tofu), with their lower moisture content, are cut into bite-sized cubes or triangles and deep fried until they develop a golden-brown, crispy surface (炸豆腐 in Chinese, zhádòufu, lit. "fried tofu"). These may be eaten on their own or with a light sauce, or further cooked in liquids; they are also added to hot pot dishes or included as part of the vegetarian dish called luohan zhai. This deep fried tofu is also called Atsuage (厚揚げ) or Namaage (生揚げ) in Japan. The thinner variety, called Aburaage (油揚げ), develops a tofu pouch often used for Inari-sushi. Thousand layer tofu (千葉豆腐, qiānyè dòufu, literally "thousand layer tofu," or 凍豆腐 dòngdòufu, 冰豆腐 bīngdòufu in Chinese, both meaning "frozen tofu"): When tofu is frozen, the large ice crystals that develop within it result in the formation of large cavities that appear to be layered. Frozen tofu takes on a yellowish hue in the freezing process. Thousand layer tofu is commonly made at home from Asian soft tofu, although it is also commercially sold as a specialty in parts of Taiwan. This tofu is defrosted and sometimes pressed to remove moisture prior to use. Koya-dofu (kōya-dōfu, 高野豆腐 in Japanese): The name comes from Mount Koya, a center of Japanese Buddhism famed for its shōjin ryōri, or traditional Buddhist vegetarian cuisine. It is sold in freeze-dried blocks or cubes in Japanese markets. Since it is dried, it can be preserved long term. It must be soaked in water before eating, and is typically simmered in dashi, sake or mirin and soy sauce. In shōjin ryōri, vegetarian kombu dashi, made from seaweed, is used. When prepared in the usual manner, it has a spongy texture and mildly sweet or savory flavor (the taste and flavor depending on what soup or cooking stock it was simmered in). A similar form of freeze-dried tofu, in smaller pieces, is found in instant soups (such as miso soup), in which the toppings are freeze-dried and stored in sealed pouches. Tofu production creates some edible by-products. Food products are made from the protein-oil film or "skin" that forms over the surface of boiling soy milk in an open shallow pan. The solids leftover from pressing soy milk are called okara. Tofu skin is produced when soy milk is boiled in an open, shallow pan, thus producing a film or skin composed primarily of a soy protein-lipid complex on the liquid surface. The films are collected and dried into yellowish sheets known as soy milk skin (腐皮, fǔpí in Chinese; 湯葉, yuba in Japanese). Its approximate composition is : 50–55% protein, 24–26% lipids (fat), 12% carbohydrate, 3% ash, and 9% moisture. The skin can also be bunched up into a stick form and dried into a product known as "tofu bamboo" (腐竹, fǔ zhú in Chinese; phù trúc in Vietnamese; kusatake, Japanese), or into myriad other forms. Since tofu skin has a soft yet rubbery texture, it is folded or shaped into different forms and cooked further to imitate meat in vegan cuisine. Some factories dedicate their production to tofu skin and other soy membrane products. Okara (from the Japanese, おから, okara; known as 雪花菜, xuěhuācài, in Chinese, lit. "snowflake vegetable"; 豆腐渣, dòufuzhā, also Chinese, lit. "tofu sediment/residue"; and 콩비지, kongbiji, in Korean), is a tofu by-product sometimes known in the west as "soy pulp" or "tofu lees", consisting of the fiber, protein, and starch left over when soy milk has been extracted from ground soaked soybeans. Although it is mainly used as animal feed in most tofu producing cultures, it is sometimes used in Japanese and Korean cuisines, such as in the Korean stew kongbiji jjigae (콩비지찌개). It is also an ingredient for the vegetarian burgers produced in many Western nations. Due to their Asian origins and their textures, many food items are called "tofu" even though their production processes are not technically similar. For instance, many sweet almond tofus are actually gelatinous desserts hardened using agar or gelatin. Some foods, such as Burmese tofu, are not coagulated from the "milk" of the legume but rather set in a manner similar to soft polenta, Korean muk, or the jidou liangfen of Yunnan province of Southwest China. "Almond tofu" (Chinese: 杏仁豆腐 xìngrén dòufu; Japanese: annindōfu) is a milky white and gelatinous resembling tofu, but it does not use soy products or soy milk and is hardened with agar. 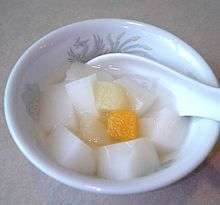 A similar dessert made with coconut milk or mango juices may occasionally be referred to as "coconut tofu" or "mango tofu", although such names are also given to hot dishes that use soy tofu and coconut or mango in the recipe. Egg tofu (Japanese: 玉子豆腐, 卵豆腐, tamagodōfu) (Chinese: 蛋豆腐, dàn dòufu; often called 日本豆腐, rìbĕn dòufu, lit. "Japan bean curd") is the main type of savory flavored tofu. Whole beaten eggs are combined with dashi, poured into molds, and cooked in a steamer (cf. chawanmushi). This tofu has a pale golden color that can be attributed to the addition of eggs and, occasionally, food coloring. This tofu has a fuller texture and flavor than silken tofu, which can be attributed to the presence of egg fat and protein. Plain "dried tofu" can be flavored by stewing in soy sauce (滷) to make soy-sauce tofu. It is quite common to see tofu sold in market in this soy-sauce stewed form. The tofu known as goma-dōfu is made by grinding sesame into a smooth paste, combining ot with liquid and kudzu starch, and heating it until curdling occurs. It is often served chilled as hiyayakko. In Okinawa, Japan, jīmāmi-dōfu is made in a process similar to that used for sesame tofu. A peanut milk (made by crushing raw peanuts, adding water and straining) is combined with starch (usually sweet potato known locally as umukuji　or umukashi (芋澱粉)) and heated until curdling occurs. Burmese tofu (to hpu in Burmese) is a legume product made from besan (chana dal) flour; the Shan variety uses yellow split pea flour instead. Both types are yellow in color and generally found only in Myanmar, though the Burman variety is also available in some overseas restaurants serving Burmese cuisine. Burmese tofu may be fried as fritters cut into rectangular or triangular shapes. Rice tofu, called hsan to hpu (or hsan ta hpo in Shan regions) is made from rice flour (called hsan hmont or mont hmont) and is white in color, with the same consistency as yellow Burmese tofu when set. It is eaten as a salad in the same manner as yellow tofu. Tofu has very little flavor or smell of its own. Consequently, tofu can be prepared either in savory or sweet dishes, acting as a bland background for presenting the flavors of the other ingredients used. As a method of flavoring it is often marinated in soy sauce, chilis, sesame oil, etc. In Asian cooking, tofu is eaten in myriad ways, including raw, stewed, stir-fried, in soup, cooked in sauce, or stuffed with fillings. The idea of using tofu as a meat substitute is not common in East Asia. Many Chinese tofu dishes such as jiācháng dòufu (家常豆腐) and mápó dòufú (麻婆豆腐) include meat. In Japan, a common lunch in the summer months is hiyayakko (冷奴), silken or firm Asian tofu served with freshly grated ginger, green onions, or katsuobushi shavings with soy sauce. In the winter, tofu is frequently eaten as "yudofu," which is simmered in a clay pot with vegetables (ex:chinese cabbage, green onion, etc.) using konbu dashi. Douhua (豆花), is a soft tofu dish. The fresh tofu is served warm and dressed with sweet syrup. Lamma Island, Hong Kong. In Korean cuisine, dubu gui (두부구이) consists of pan fried cubes of firm tofu seasoned with soy sauce, garlic, and other ingredients. Cubes of cold, uncooked firm tofu seasoned with soy sauce, scallions, and ginger, prepared in a manner similar to the Japanese hiyayakko, are also enjoyed. The popular bar food, or anju (안주), called dubu kimchi (두부김치), features boiled, firm tofu served in rectangular slices around the edges of a plate with pan fried, sautéed or freshly mixed kimchi (김치) in the middle. In the Philippines, the sweet delicacy taho is made of fresh tofu with brown sugar syrup and sago. The Singaporean version of taho or douhua is called tofufa. Warm soft tofu is served in slices (created by scooping it from a wooden bucket with a flat spoon) in a bowl with either pandan-flavored sugar syrup or palm sugar syrup. In Vietnam, dòuhuā, pronounced đậu hủ, is a variety of soft tofu made and carried around in an earthenware jar. It is served by being scooped into a bowl with a very shallow and flat spoon, and it is eaten together with either powdered sugar and lime juice or a ginger-flavored syrup. It is generally eaten hot, also in summer. A common cooking technique in many parts of East and Southeast Asia involves deep frying tofu in vegetable oil, sunflower oil, or canola oil with varied results. In Indonesia, it is usually fried in palm oil. Although tofu is often sold preprocessed into fried items, pre-fried tofu is seldom eaten directly and requires additional cooking. Depending on the type of tofu used, the texture of deep fried tofu may range from crispy on the outside and custardy on the inside, to puffed up like a plain doughnut. The former is usually eaten plain in Chinese cuisine with garlic soy sauce, while the latter is either stuffed with fish paste to make Yong Tau Foo or cooked in soups. In Taiwan, fried tofu is made into a dish called "A-gei", which consists of a fried aburage tofu package stuffed with noodles and capped with surimi. In Japan, cubes of lightly coated and fried tofu topped with a kombu dashi-based sauce are called agedashi-dofu (揚げ出し豆腐). Soft tofu that has been thinly sliced and deep fried, known as aburage in Japan and yubu (유부) in Korea, is commonly blanched, seasoned with soy sauce and mirin and served in dishes such as kitsune udon. Aburage is sometimes also cut open to form a pocket and stuffed with sushi rice; this dish is called inarizushi (稲荷寿司) and is also popular in Korea, where it is called yubu chobap (유부초밥). 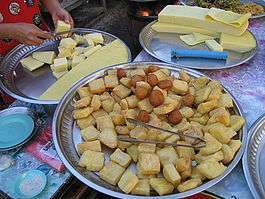 In Indonesia, tofu is called tahu, and the popular fried tofu is tahu goreng, tahu isi or tahu sumedang. A spicy Sichuan preparation using firm Asian tofu is mápó dòufu (麻婆豆腐). It involves braised tofu in a beef, chili, and fermented bean paste sauce. A vegetarian version is known as málà dòufu (麻辣豆腐) . Dried tofu is usually not eaten raw but first stewed in a mixture of soy sauce and spices. Some types of dried tofu are pre-seasoned with special blends of spices, so that the tofu may either be called "five spice tofu" (五香豆腐 wǔxiāng dòufu) or "soy sauce stewed tofu" (鹵水豆腐 lǔshuǐ dòufu). Dried tofu is typically served thinly sliced with chopped green onions or with slices of meat for added flavor. 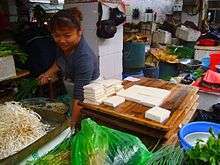 Most dried tofu is sold after it has been fried or pre-stewed by tofu vendors. Soft tofu can also be broken up or mashed and mixed with raw ingredients prior to being cooked. For example, Japanese ganmodoki is a mixture of chopped vegetables and mashed tofu. The mixture is bound together with starch and deep fried. Chinese families sometimes make a steamed meatloaf or meatball dish from equal parts of coarsely mashed tofu and ground pork. In India, tofu is also used as a low fat replacement for paneer, providing the same texture with similar taste. Japanese 'miso soup', stocks with miso paste, is frequently made with tofu. In Korean cuisine, soft tofu, called sundubu (순두부), is used to make a thick stew called sundubu jjigae (순두부 찌개). Firm, diced tofu often features in the staple stews doenjang jjigae (된장 찌개) and kimchi jjigae (김치 찌개). At Qufu, the home town of Confucius, smoked tofu is a popular dish. Bacem is a method of cooking tofu originating in Java, Indonesia. The tofu is boiled in coconut water, mixed with lengkuas (galangal), Indonesian bay leaves, coriander, shallot, garlic, tamarind and palm sugar. After the spicy coconut water has completely evaporated, the tofu is fried until it is golden brown. The result is sweet, spicy, and crisp. This cooked tofu variant is commonly known as tahu bacem in Indonesian. Tahu bacem is commonly prepared along with tempeh and chicken. Firm Western tofu types can be barbecued. since they hold together on a barbecue grill. These types are usually marinated overnight as the marinade does not easily penetrate the entire block of tofu (techniques to increase penetration of marinades are stabbing repeatedly with a fork or freezing and thawing prior to marinating). Grated firm Western tofu is sometimes used in conjunction with TVP as a meat substitute. Softer tofus are sometimes used as a dairy-free or low-calorie filler. Silken tofu may be used to replace cheese in certain dishes (such as lasagna). 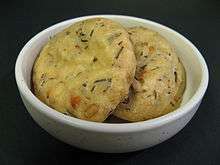 Tofu has also been fused into other cuisines in the West, for instance in Indian-style curries. Tofu and soy protein can be industrially processed to match the textures and flavors of cheese, pudding, eggs, bacon, and similar products. Tofu's texture can also be altered by freezing, pureeing, and cooking. In the Americas, Europe, Australia and New Zealand, tofu is frequently associated with vegetarianism and veganism as it is a source of non-animal protein. The most commonly held of the three theories of tofu's origin maintains that tofu was invented in northern China around 164 BC by Lord Liu An, a Han Dynasty prince. Although this is possible, the paucity of concrete information about this period makes it difficult to conclusively determine whether Liu An himself invented the method for making tofu. In Chinese history, important inventions were often attributed to important leaders and figures of the time. In 1960, a stone mural unearthed from an Eastern Han dynasty tomb provided support for the theory of Han origin of tofu, however some scholars maintained that the tofu in Han dynasty was rudimentary, and lacked the firmness and taste of real tofu. Another theory states that the production method for tofu was discovered accidentally when a slurry of boiled, ground soybeans was mixed with impure sea salt. Such sea salt would probably have contained calcium and magnesium salts, allowing the soy mixture to curdle and produce a tofu-like gel. Korean sundubu (soft tofu) and Okinawan tofu is still produced in a similar manner, traditionally using seawater as a coagulant. This may possibly have been the way tofu was discovered, since soy milk has been eaten as a savory soup in ancient as well as modern times. Its technical plausibility notwithstanding, there is little evidence to prove or disprove that tofu production originated in this way. The theory that tofu was invented by Lord Liu An of Huainan in about 164 BC (early Han dynasty) has steadily lost favor among most scholars in China and abroad since the 1970s. The claim concerning Liu An was first made by Zhu Xi during the Song dynasty (960-1127 AD) - roughly 1,000 years after the supposed invention. The theory that tofu-making is shown in a mural incised on a stone slab in Han Tomb No.1, at Da-hu-ting, Mixian, Henan province attracted much attention around 1990. Yet this too is debatable because (1) no step of cooking the soy puree is shown in the mural, and (2) when Chinese food historians tried to make tofu without cooking the puree, the result was a tiny amount of unpalatable material. Thus, while there are many theories regarding tofu's origins, historical information is scarce enough to relegate the status of most theories to either speculation or legend. Like the origins of cheese and butter, the exact origin of tofu production may never be known or proven. The historical era starts in the year 965 AD (early Song dynasty) with the Qing Yilu by Tao Ku. What is known is that tofu production is an ancient technique. Tofu was widely consumed in ancient China, and techniques for its production and preparation eventually spread to many other parts of Asia. Its development likely preceded Liu An, as tofu is known to have been a commonly produced and consumed food item in China by the 2nd century BC. Although the varieties of tofu produced in ancient times may not have been identical to those of today, descriptions from writings and poetry of the Song and Yuan Dynasty show that the production technique for tofu had already been standardized to the extent that they would be similar to contemporary tofu. Tofu and its production technique were subsequently introduced into Korea and then Japan in the Nara period (late 8th century) as well as into other parts of East Asia. The earliest document concerning tofu in Japan shows that the dish was served as an offering at the Kasuga Shrine in Nara in 1183. The book Tofu Hyakuchin (豆腐百珍 Dòufu Bǎizhēn), published in the Edo period, lists 100 recipes for cooking tofu. The rise in acceptance of tofu likely coincided with that of Buddhism, as it is an important source of proteins in that religion's vegetarian diet. Since then, tofu has become a staple in many countries, including Vietnam, Thailand, and Korea, with subtle regional variations in production methods, texture, flavor, and usage. In Southeast Asia, tofu was introduced to the region by Chinese immigrants from sea-faring Fujian provinces, evident from the fact that many countries in Southeast Asia refer to tofu using the Min Nan Chinese pronunciations for either soft and firm tofu, or "tāu-hū" and "tāu-goan" respectively. In Indonesia, Malaysia, Singapore, Thailand and the Philippines, tofu is widely available and used in many local dishes. Tofu is called tahu in Indonesia, and Indonesian dishes such as tahu sumbat, taoge tahu, asinan, siomay and some curries are often add slices of tofu as an ingredient. In addition, tahu goreng, tahu isi and tahu sumedang are popular fried tofu snacks. Tofu is called tauhu in Malaysia and Singapore. Malaysian and Singaporean Indians use tofu in their cuisine. such as in Indian mee goreng, rojak pasembor. The strait peranakan cuisine often uses tofu, such as in mee kari Penang and laksa. The makers of tofu in these countries were originally Chinese but tofu now is made also by non-Chinese. Indonesia, Thailand, Malaysia and the Philippines are major producers of tofu and have plants located in many municipalities. However, Singapore imports its tofu from its neighboring country, Malaysia. Tofu in the Philippines is essential to the daily diet, as taho, widely eaten as breakfast, or tokwa (a dry fried variation), which is a staple or alternative to meat in main meals and in numerous regional dishes. Tofu was introduced to the archipelago in the 10th to 13th centuries by Song Chinese mariners and merchants, along with many different foods which had become staples of the Philippine diet. The use and production of tofu were first limited to urban centers with influential Chinese minorities, such as Cebu or Tondo, but quickly spread to even remote native villages and islands, long before the Spanish arrival in the 17th century. Benjamin Franklin was the first American to mention tofu in a 1770 letter to John Bartram. Franklin, who discovered it during a trip to London, included a few soybeans and referred to it as "cheese" from China. The first tofu company in the United States was established in 1878. In 1908 Li Yuying, a Chinese anarchist and a vegetarian with a French degree in agriculture and biology, opened a soy factory, the Usine de la Caséo-Sojaïne, which was the world's first soy dairy and the first factory in France to manufacture and sell beancurd. However tofu was not well known to most Westerners before the middle of the 20th century. With increased cultural contact between the West and East Asia and growing interest in vegetarianism, knowledge of tofu has become widespread. Numerous types of pre-flavored tofu can be found in many supermarket chains throughout the West. It is also used by many vegans and vegetarians as a means to gain protein without consuming meat products. In Chinese traditional medicine, tofu is considered suitable for those who are weak, malnourished, deficient in blood and qi; for the elderly and slim; for those with high fat content in blood, high cholesterol, overweight, and with hardened blood vessels; for people with diabetes; for mothers with low breast milk supply; for children and young adults; for those with an inflamed respiratory tract, phlegm, coughing or asthma. Tofu is also suited for people of old age; it is recommended that it be eaten together with liquor, since tofu contains cysteine, which can speed up the detoxification of alcohol in the body and lessen the harm done to the liver. Tofu is relatively high in protein, about 10.7% for firm tofu and 5.3% for soft "silken" tofu, with about 5% and 2% fat, respectively. respectively as a percentage of weight. In 1995, a report from the University of Kentucky, financed by Solae, concluded that soy protein is correlated with significant decreases in serum cholesterol, Low Density Lipoprotein LDL (″bad cholesterol″) and triglyceride concentrations. However, High Density Lipoprotein HDL (″good cholesterol″) did not increase. 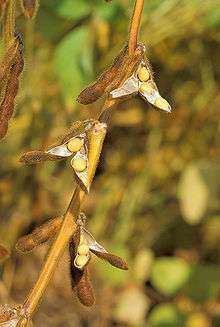 Soy phytoestrogens (isoflavones: genistein and daidzein) absorbed onto the soy protein were suggested as the agent reducing serum cholesterol levels. On the basis of this research, PTI, in 1998, filed a petition with Food and Drug Administration for a health claim that soy protein may reduce cholesterol and the risk of heart disease. The FDA granted this health claim for soy: "25 grams of soy protein a day, as part of a diet low in saturated fat and cholesterol, may reduce the risk of heart disease." For reference, 100 grams of firm tofu coagulated with calcium sulfate contains 8.19 grams of soy protein. In January 2006, an American Heart Association review (in the journal Circulation) of a decade-long study of soy protein benefits showed only a minimal decrease in cholesterol levels, but it compared favorably against animal protein sources. Because it is made of soy, individuals with allergies, particularly those allergic to legumes, should not consume tofu. ↑ Du Bois (2008), pp. 13-14. ↑ "History of tofu". Soya.be. 2015-11-29. Retrieved 2016-10-11. ↑ Shurtleff, W.; Aoyagi, A (2013). History of Tofu and Tofu Products (965 CE to 2013). Soyinfo Center. p. 305. ISBN 9781928914556. 1 2 "Technology of production of edible flours and protein products from soybeans. Chapter 9". Fao.org. Retrieved 2016-10-11. ↑ "[Homestead] Making tofu". Lists.ibiblio.org. Retrieved 2016-10-11. 1 2 Guo & Ono 2005. ↑ Chowhound (2008-04-03). "Make Your Own Tofu - Chowhound". Chow.com. Retrieved 2016-10-11. ↑ "The evaluation of proteases as coagulants for soy protein dispersions". ScienceDirect. ↑ "Papain-induced Gelation of Soy Glycinin". Wiley Online Library. 1 2 Shurtleff & Aoyagi 2000. ↑ Sung, Esther. "Our Favorite Tofu Recipes". Epicurious.com. Retrieved 2016-10-11. ↑ The Hwang Ryh Shang Company of Taiwan, a major producer of pickled tofu, mislabels this ingredient as "red date" (jujube) on the English-language list of ingredients on its product labels, although the Chinese list of ingredients on the same product lists 紅糟 (literally "red lees", i.e. red yeast rice). ↑ Broken link, The Soy Daily, archived from the original on March 23, 2006 Not retrieved on 5 January 2008. 1 2 3 Shurtleff & Aoyagi 2005. ↑ "History, Travel, Arts, Science, People, Places | Smithsonian". Smithsonianmag.com. Retrieved 2016-10-11. ↑ "Chronology of Tofu Worldwide". Soyinfocenter.com. Retrieved 2016-10-11. 1 2 "Chinese Medicine Encyclopedia -- Tofu". 2009. Retrieved 8 October 2015. ↑ "tofu Nutrition Information in Legumes and Legume Products". Nutritiondata.self.com. Retrieved 2016-10-11. ↑ Ang, Liu & Huang 1999. ↑ USDA National Nutrient Database for Standard Reference, Release 24 (year 2012): http://ndb.nal.usda.gov/ndb/foods/show/4817. Du Bois, Christine M., Chee Beng Tan and Sidney Wilfred Mintz (2008). The World of Soy. Urbana: University of Illinois Press. ISBN 9780252033414. Liu, KeShun (1997), Soybeans: Chemistry, Technology, and Utilization, Springer, ISBN 978-0-8342-1299-2 . Shurtleff, William; Aoyagi, Akiko (1998), The book of tofu: protein source of the future-- now!, Ten Speed Press, ISBN 1-58008-013-8 .